Call 860-308-1728 to schedule your first appointment. When you begin to suspect that it might be time for a hearing aid and you want to ensure that you receive a quality product, come discover and experience the Miracle-Ear® advantage. With more than 70 years of experience in providing hearing solutions, we're the most recognized brand of hearing aids in America. We offer an excellent selection of hearing aids in Torrington, CT, and we're confident we can assist you in finding the best match for your needs. Could You Benefit From a Hearing Aid? You ask people to repeat themselves. You think everyone is mumbling. You have difficulty discerning conversation in crowded environments. You're nervous about meeting new people for fear of not understanding what they say. You hear a constant ringing noise. Our hearing aid center proudly provides the necessary care you’ll need to maintain your hearing aid. We stand by our products and offer an annual free checkup, at which time we'll examine your hearing aid and interview you regarding your listening experience. This ensures you're getting the maximum benefit from your hearing aid. You’ll be able to get it serviced at any of our more than 1300 Miracle-Ear locations nationwide. We invite you to come to Miracle-Ear and see for yourself why we're leaders in hearing aid advancements. Our GENIUS™ Technology reduces unwanted noise and allows you to zero in on conversations in any direction. Call us today and find out more. Our hearing center in Torrington is independently owned and operated, and our experienced specialists will work with you to provide you with the best hearing solution possible. 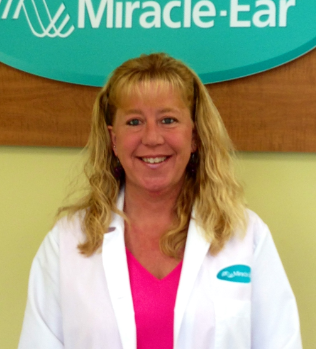 Tammy started working with Miracle Ear in 2010 when the Torrington office first opened it's doors. Tammy has 6 years experience. Tammy is licensed by the State of Connecticut. She is a member of IHS. She has received 4 Value of Excellence awards; 3 of them for Outstanding Customer Service and 1 for the Most Improved Store. She was awarded a Certificate Of Recognition from The Miracle Ear Foundation. Most recently she was a recipient of The Miracle Ear High Achievers Award for one of the top 40 Hearing Care Professionals across the country. Tammy's favorite part of working for Miracle Ear is being able to change people's live's with the gift of sound. Proper hearing help is so important. Making an impact of the quality of life for her patient's is her number one goal.